Rotary’s special guest speaker is Steve Falk, CEO of the newly formed Sonoma Media Investors, who has been a newspaperman for most of his life. He began his journalist’s career with Lancaster Newspapers during high school and college and worked for newspapers in Ohio, Pennsylvania, and was vice-president/circulation director with Gannett Westchester Rockland Newspapers where he also planned and directed the launch of USA today in the northern suburbs of New York City. In the late 1980s Mr. Falk moved to San Francisco and joined The Chronicle, where he was most recently Publisher and President. In 2005 he was named President & CEO of the San Francisco Chamber of Commerce. 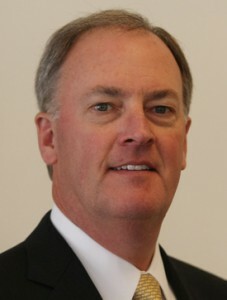 He became CEO of Sonoma Media Investments, LLC, in December 2012. Tim Delaney welcomed our two visiting Rotarians—Public Safety Officer Richard Lazarus, Fire Chief from Longview, Texas,—and in communications from Sebastopol Rotary, Kristi Dee Doden. 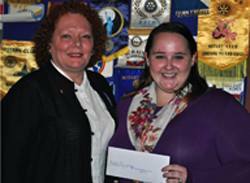 Shannon McConnell introduced Rotarian Sandy Stabile from the Fremont Rotary Club. Welcome to our fellow Rotarians from near and far! Another crowd of guests were welcomed today by an even larger crowd of Rotarians from the most active Rotary Club in Sonoma County. Past President Rich de Lambert welcomed back Brandon Uhrich with State Farm Insurance. Club Secretary Jack Abercrombie introduced his guest, Elizabeth Karbousky, and Eileen Carlisle introduced her two guests from the Sonoma County YWCA—chief executive officer Madeleine O’Connell and Preschool Director Teri Porter. 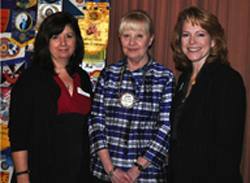 Past President Debi Zaft introduced special guest, Julie Long, representing Social Advocates for Youth. Kerrie Chambers and Wayne Rowlands welcomed respectively, business banker Manuela Gonzalez and CABi Consultant Annette Walker. And Shannon McConnell introduced today’s speaker, a critical-care nurse volunteering with Rotaplast, Sandy Stabile. Jack Abercrombie cancelled last week’s Change of Venue announcement: The Rotary Club’s meeting next Wednesday noon will be held in the Flamingo Ballroom. Because of the great interest in the new ownership plans for the Press Democrat and the Business Journal, guest speaker CEO Steve Falk will be introduced 10 minutes early Wednesday afternoon to allow more time for your questions and answers. Have your questions ready, raise your hand, and wait for the microphone so that all of us can hear your questions clearly. Clear skies ahead as Robert Pierce welcomed back Past President Steve Olson, who proved he was recovering rapidly from his recent hip replacement. Steve happily re-introduced to Rotary a valuable former member of our club, CPA Judith Glenn. An active member of the Rotary Club since 2002, Judith had taken a hiatus from active Rotary to devote attention to her accounting firm of Glenn, Guattery, Gunn & McAravy. Welcome back, Judith. Boy, did we miss you! And dear old Steve too, who was back so soon with his new hip that some of us barely noticed he was gone. 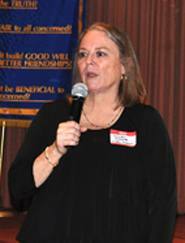 Karen Ball proudly reported that this week’s Rotary Raffle Jackpot stood at $373. With that much cash in the kitty, and only 44 non-jokers left in the deck, next week’s winner won’t even miss this week’s $10 consolation prize. Mike Kallhof held the lucky number but drew the wrong card. He was somewhat consoled by a tiny portrait of the first Secretary of the U. S. Treasury. Remember last month’s good news from our local Rotary Foundation that this year’s $17,500 project costs for dictionaries distributed to all Santa Rosa 3rd graders was funded by last July’s Giro Bello and October’s Casino Royale? This week our Rotary Club awarded two $5,000 local foundation grants to the Sonoma County YWCA and the venerable Social Advocates for Youth organization, founded almost 40 years ago in Sonoma County. The YWCA grant was presented to CEO Madeleine O’Connell for their outdoor playground paving project. Terri Porter, principal of the YWCA’s Special School for troubled two to four years old preschoolers, emphasized the need to restore the school house’s safe and secure outdoor classroom environment. Fellow Rotarian Troy Carrington immediately went to work to help reduce the cost of the materials, stretching the value of the grant to enhance the benefits for the young students. Social Advocates for Youth: The second $5,000 grant was presented to SAY volunteer Julie Long to provide support, opportunities, and hope to local children, youth, and families through counseling, housing and SAY’s innovative “Backpacks of Hope” program for local youths living on the streets. Eileen Carlisle told us after the meeting that when Michelle Fannin learned about SAY’s safe house from husband Matt Fannin she contacted friends who donated dozens of stuffed animals for SAY’s youngest preschoolers. Tour invitations: Madeleine O’Connell, Terri Porter, and Julie Long invited Rotarians to tour the YWCA and SAY facilities for young children. Witness in person these Rotary-funded grants in progress. As this year’s first fundraising event swings into action it should be obvious that the Third Annual Giro Bello is much more than another Sonoma County cycling event. 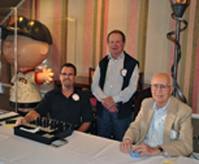 In only two years Giro Bello that—along with the Casino Royale fall spectacular—is the powerhouse generator that enables us to grow the benefits of Rotary’s multiple avenues of service to Santa Rosa, Sonoma County, and the global impact of Rotary International. These projects and our commitments must become a resounding call to action and a full commitment by each and every Rotarian who belongs to the Rotary Club of Santa Rosa. Giro Bello is open for business: We need you working on behalf of those in our communities who need us most. The 2013 Giro Bello event takes place in West County on Saturday, July 6th, based in Sebastopol at the beautiful O’Reilly Media Business Park, on Gravenstein Highway North. No matter what your passion or what your skills, we need your participation. Contact Doug Johnson, Chair of this year’s Giro Bello. Those interested in helping should email Doug at djohnson@discoveryofficesystems.com, or contact him immediately at 707-849-6429. We anticipate more than 1,000 registrations by riders from the whole San Francisco Bay Area signing up to participate in one of three “Beautiful Rides”—the 30 mile Fun Ride, the 70 mile Metric Century, and the 100 Mile Century Ride. If we can meet our goals, this single event will enable us to fund close to $75,000 for new and on-going community grants and project benefitting thousands of Santa Rosa families and children. The Giro Bello website is the best place to go for info and registration. Here’s the deal: Petaluma Sunrise Rotary’s Backroad Challenge Bike Event premiered only two months before last year’s Giro Bello. Some of their volunteers jumped in and helped our fellow Rotarians with our Giro Bello. No problem, right? This year both Rotary Clubs agree that they can use more help this year. 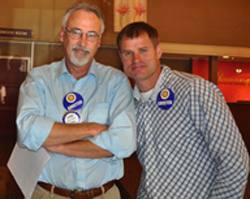 To volunteer for Petaluma Sunrise Rotary’s Backroad Challenge, let Doug Johnson know that you want to volunteer on Saturday, May 18 for the Backroad Challenge; and our club’s Giro Bello on July 6th. 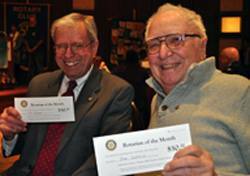 Catch-up time for President William as he announced that the club had not recognized the Rotarian of the Month for January. Congratulations to both Dan Schell and Jim Johnson. When last seen, Jim & Dan were at the desert table, arguing over who was January and which was February. Dan won because he glibly recited two of his limericks. Several times. No word yet which month he liked best. 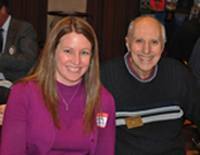 New Rotarian Shannon O’Connell got her first taste of the connections Rotary can open for us when she made up a meeting at a Rotary Club in Fremont and heard Rotarian Sandy Stabile talking about Rotaplast. A critical-care nurse for 33 years, Sandy started volunteering years ago for surgical missions because of her interest in surgical correction of anomalies in children. Last Wednesday we got a first-person education on the miracles that Rotaplast teams have performed more than 15,000 times in dozens of countries around the globe. It is hard to conceive that every two minutes, somewhere in the world, a child is born with a cleft lip and/or cleft palate, a birth defect that poses serious consequences if not corrected. In the United States and other industrialized nations, these common defects are repaired by advanced surgical treatment that is not available in much of the world. Rotaplast was started by two surgeons 20 years ago as a community service project by the Rotary Club of San Francisco. It was incorporated as an independent non-profit in 1996. Sandy said that she pays a $350 fee to volunteer on each overseas surgical mission. Each team requires from $65,000 to $100,000. 35 boxes of durable equipment and medical supplies accompany each team, including non-medical volunteers to assist in all aspects of a mission. Veteran Rotarians have been indoctrinated about the Rotoplast missions, but Sandy Stabile’s personal experiences on 14 missions taught us in a few minutes of the power of Rotary and the impact of what we can do for others…and for ourselves. Rotarian at Work and Giro Bello tee-shirts for sale!